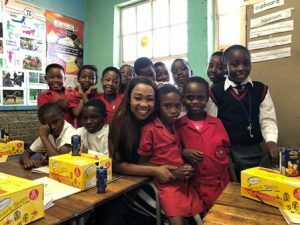 METRO FM and celebrity star Dineo Ranaka has gone back to school. Bundle of Joys. Metro FM’s Dineo Ranaka, sandwiched by learners from Thembalihle Primary School in Orlando, Soweto. She donated 1000 new pairs of shoes as part of #KrushGoodness project this week. But this time she did not attend any classes but donated shoes at the Thembalihle Primary School – Orlando East, Soweto. Thembalihle loosely translated means good-hope and hope did reign in at the school. The flamboyant Dineo made a donation of 1000 brand new pair of Smart Steps school shoes as part of the project, supported by #KrushGoodness, this week. Well-known figures (from last year have and will continue) over the next few weeks donate 20 000 pairs of Smart Steps school shoes, country-wide, whose aim is to make a sustainable difference in the lives of 20 000 learners across South Africa, giving them the confidence to conquer the world one step at a time. According to Stats SA, approximately 70% of learners walk to school every day, many of whom walk barefoot or with damaged shoes. This happens in schools mostly in remote areas or under-developed cities. Eugasen Reddy, Managing Director of Novita Shoes, is glad to be involved with the project for a second year. “Having seen, first hand, the impact that this project had on children in need, there was no question about us wanting to be a continual partner of this great initiative. The #KrushGoodness project is aligned with Novita’s vision of empowering the youth of South Africa. By supporting our youth, we are contributing to educating our children who are the future of our country. The real gift of gratitude is seeing the joy and appreciation from kids less fortunate and the Novita team are very grateful to be a part of that amazing journey once again. A single pair of school shoes to a child symbolises pride, creates excitement, and gives confidence which positively transforms their lives. By investing in a pair of school shoes, you encourage a child to walk his pathway to education and success,” says Reddy. Smart Steps by Novita is the shoe partner for the campaign. Businesswoman Connie Ferguson, Dineo Ranaka, Zenande Mfenyane, Rami Chuene, Lalla Hirayama, Letshego Zulu, Thembi Seete, Ayanda Thabethe, Leanne Manas, Brent “Good Things Guy” Lindeque, Shona Ferguson and Heather Hook, are some of the celebs who are behind and supporting this worthy cause. Miantha Roux, Marketing Manager: Beverages – Clover, is thrilled to have even more well known and loved South African personalities on board with the project. “The response we received from South Africa upon announcing that the #KrushGoodness project was back for a second year was phenomenal. And to now have even more celebrities who represent goodness joining us as part of the #KrushGoodness Krew is something very special and will allow us to spread the goodness even further,” she says.